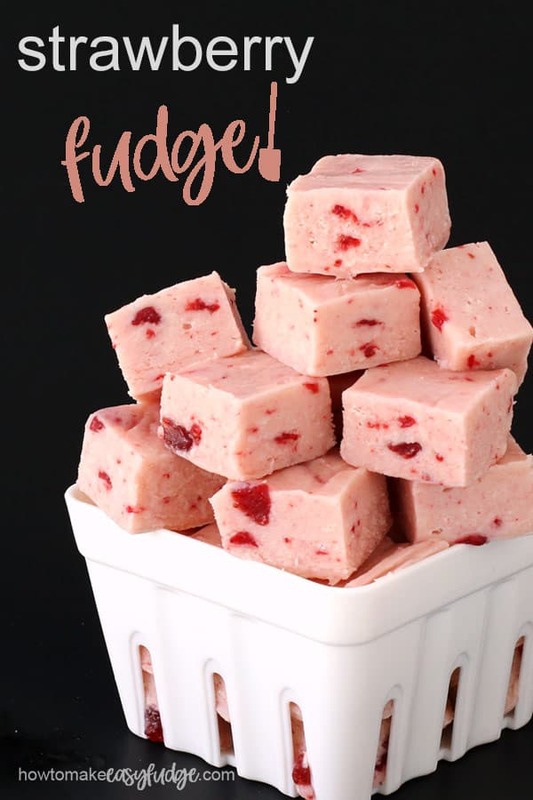 Easy Microwave Strawberry Fudge Recipe – How to make easy fudge! This strawberry fudge is refreshingly sweet and loaded with little bits of strawberries. This easy fudge recipe only requires 4 ingredients and is ready to spread in the pan in about 5 minutes. If you love the sweet taste of strawberries and cream this pretty pink fudge is perfect for you. It is so soft and creamy and has little pieces of strawberries speckled throughout. This isn’t an ordinary fudge flavor that you’ll find in most fudge shops along the boardwalk at the beach. But it should be! 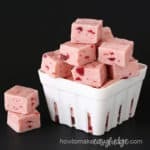 It blends vanilla fudge with strawberry sauce to make a refreshingly good fudge that would be great to serve along with lemon fudge at a summer party. 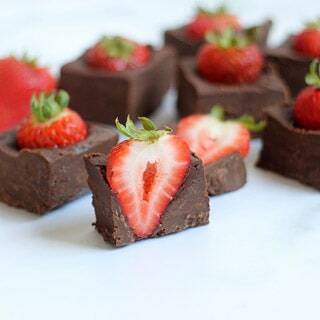 Top the strawberry fudge with a layer of chocolate fudge or a layer of chocolate ganache for a really decadent treat or if you prefer even more chocolate try our Chocolate Covered Strawberry Fudge. It as whole strawberries inside chocolate fudge. 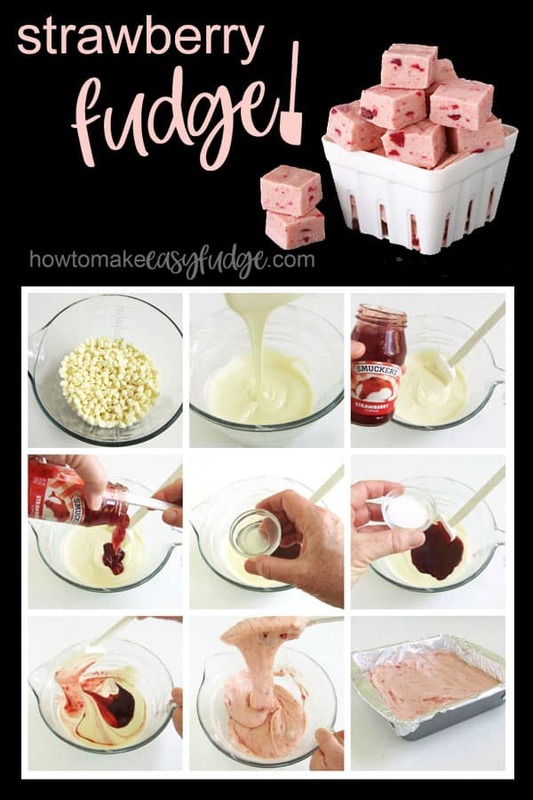 This easy strawberry fudge recipe requires just four ingredients and can be made in under 10 minutes. I used Nestle Premier White Morsels which are actually a confectionery coating (similar to white chocolate but made using palm kernel oil instead of cocoa butter). You can use pure white chocolate chips (made with cocoa butter) or any white confectionery coating like Candy Melts, Ghirardelli White Melting Wafers, Merckens White Wafers, almond bark, or CandiQuik. NOTE: If using pure white chocolate (with cocoa butter listed in the ingredients) you will need to use 28 ounces versus 24 ounces of the white confectionery coating. I used Smucker’s Strawberry Ice Cream Topping. You can also use homemade strawberry sauce. 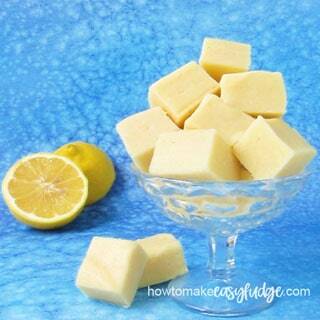 A bit of freshly squeezed lemon juice helps to balance the sweetness of this fudge. A pinch of salt also helps balance the sweetness. Start by melting white chocolate chips either in the microwave or on the stove. Pour the white chocolate chips into a microwave safe bowl and heat at high-power for 1 minute then remove and stir. Heat for another minute then allow the bowl to sit in the microwave for 3 minutes. Stir vigorously until all the chips are melted. If needed heat on high power for 15 second increments stirring after each until the white chocolate is completely melted. Create a double boiler by setting a saucepan filled with 1 inch of water over low heat on the stove. Place a bowl on top of the pan so that it goes into the pan and fits around the edge snugly but does not touch the water. Pour the white chocolate chips in the bowl and allow the white chocolate to melt slowly, stirring often. Once about three-quarters of the chips are melted remove the bowl, dry the bottom, and stir the chocolate until melted. Pour the strawberry ice cream topping into the white chocolate along with some freshly squeezed lemon juice and a pinch of salt and stir until well combined. Spread the fudge in a prepared pan, cover and chill for at least 2 hours until firm. Line an 8 inch square pan with non-stick tin foil for easy removal. Or you can line the pan with parchment paper or regular tin foil sprayed with some baking spray. You can also use an 8 x 4 inch loaf pan if you’d like pretty pink slices of homemade strawberry fudge. Cut the fudge into squares. 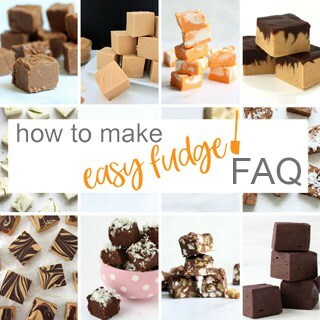 If you have any other questions about the process of making easy fudge we have a very detailed Easy Fudge Recipe FAQ page to give you all the tips and tricks we have learned. You can find the ingredients needed to make this easy fudge recipe from amazon (commission earned for sales). 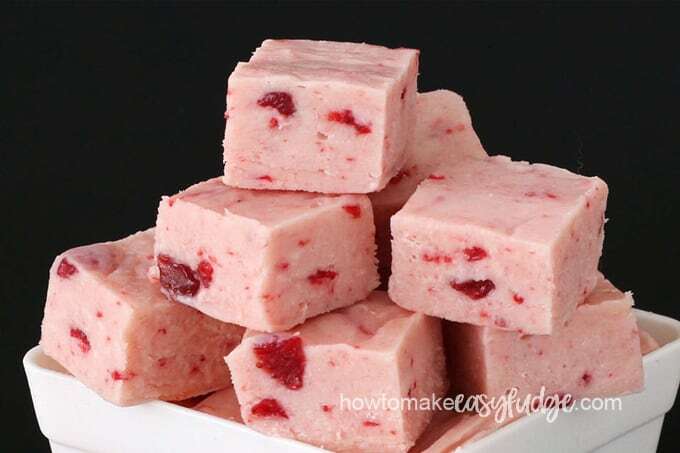 Pretty pink strawberry fudge made using strawberry sauce has speckles of strawberries throughout a white chocolate fudge. Pour the strawberry topping, lemon juice, and pinch of salt into the melted white chocolate. Pour into a non-stick tin foil lined 8-inch square baking pan. Cover and chill for at least 2 hours until firm. Remove and peel off tin foil before cutting into 36 squares. Wrap in wax paper and place in a zip top bag or in an airtight container and store in the refrigerator for up to 3 weeks or in the freezer for up to 3 months. Strawberry fudge is perfect for the warm weather we’re having. Definitely. I keep seeing lots of fall recipes but it was 92 here this week! It’s hard to get in the mood for pumpkin when it’s that hot. I’ve never heard of Strawberry fudge. Sounds delicious! It’s definitely a more unusual fudge flavor. It is wonderful! This would be a great addition to my Christmas treat boxes! Love this idea! So yummy! 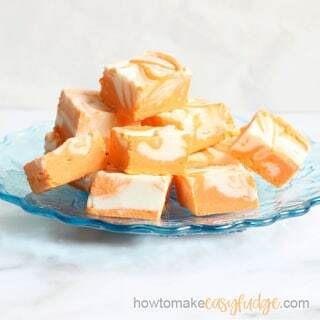 Love this idea for a fruity fudge! So pretty too! So the flavor of this is great but it did not harden. At all. The only change I made was to use real white chocolate. Any suggestions? I am sorry to hear it didn’t set up properly. I am going to make the recipe again using pure white chocolate to see if it needs to be adjusted when using the pure white chocolate and will post the follow up here as soon as I am able. I’d let the fudge sit at room temperature over night to see if it drys enough to cut. If not, you could melt some more white chocolate, allow it to cool slightly, then knead it into the fudge. I have used this technique when making modeling chocolate (a mixture of chocolate and corn syrup) and it works. If the fudge starts to feel greasy, allow it to cool for a while (up to 30 minutes) then knead it again. You want to work all the oil back into the fudge. Press the fudge into the pan again then you should be able to cut it about 30 minutes later. I just finished experimenting with this recipe using pure white chocolate and it does indeed require a higher white chocolate to strawberry sauce ratio. I first made the recipe as it, using 24 ounces of pure white chocolate and 1 jar of strawberry sauce and the lemon juice and inch of salt and, like you, found it was too soft to hold it’s shape. It did taste amazing though! So, I took 4 more ounces of pure white chocolate, grated it using a cheese grater, then melted it at 70% power for 15 second burst until it melted (it took 4 burst of power in my microwave). I then stirred the melted white chocolate into the soft fudge and pressed the fudge back into my pan and chilled it for a little over an hour. I was able to cut it easily and it held it’s shape. I will go back and add a note to the recipe accommodate this. I am so sorry I didn’t think to try this before. I hope you are able to fix your fudge!